Grant had his two month check-up yesterday. 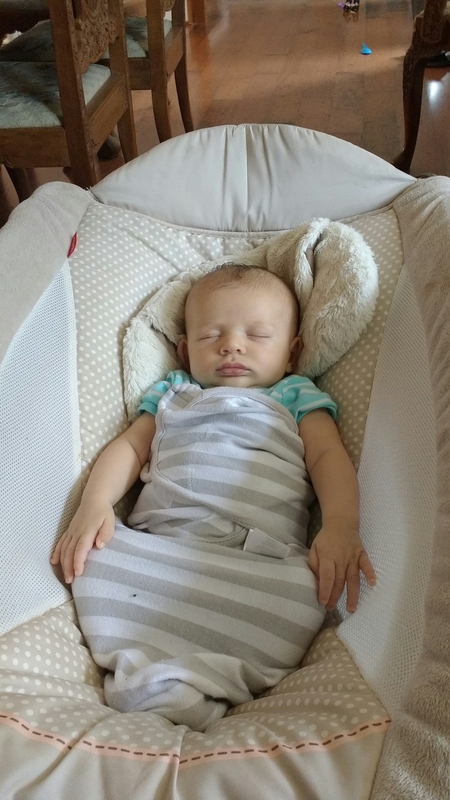 He is a little short and a little solid (not quite roly poly yet), so the doctor agreed with our assessment that he is (currently) built like a 1920s bodybuilder – he just needs a striped bathing suit and oversize dumbbells. His head is 16″, he is 22.25″ long, he is 11lbs, 11.5oz. She thinks he’ll be rolling over fairly soon, although it is early (he can go from belly to back already). He also got 4 vaccines, so he has spent much of the past 12 hours either sleeping or nursing. I find it sweet that when he has been awake and before he starts to get fussy, he has been smiley, catching my eye and grinning.